This challenge involves three beads and lots of bags. There are as many bags as you need. Find a way to put the beads into some of the bags. 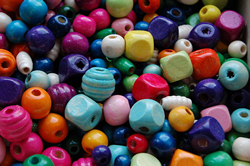 Find another different way to put the beads into some of the bags. How many different ways can you make? Have you tried putting a bag into another bag? Can you record your ways? How do you know you've got them all? Can you give your recording to a friend to see if they can re-make your way? Can you record your ways without pictures? Can you record using numbers? Does your partner always make the way you expect? Can you refine your recording so that your partner always gets it right? Addition & subtraction. Generalising. Combinations. Multiplication & division. Interactivities. Factors and multiples. Recording mathematics. Working systematically. Investigations. Visualising.